As I began working on this article examining the work of two visionary, self-taught artists, I learned that someone who has long played an instrumental role in documenting their accomplishments had fallen ill. For many years, I have known this brilliant thinker and passionate custodian of the art history of his homeland, Jamaica. 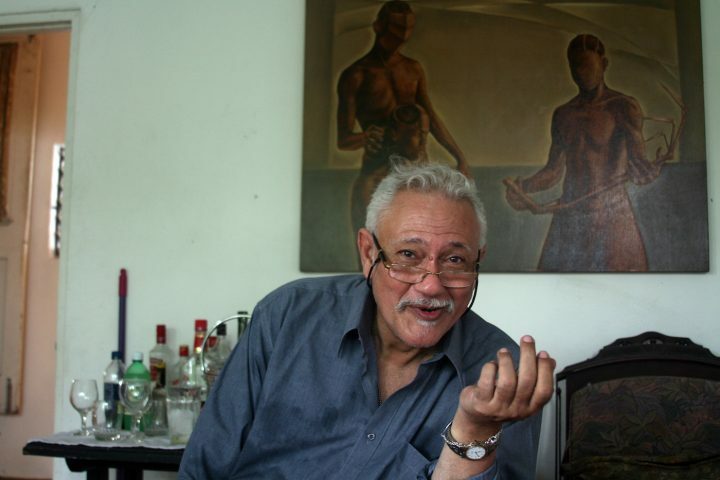 A colleague, mentor, and friend, David Boxer is a towering figure in the recent intellectual history of the Caribbean region, whose work as an educator and activist helped shape the modern cultural identity of his small nation in the post-colonial era. A working artist himself, Boxer is a former, longtime director of and chief curator at the National Gallery of Jamaica (NGJ) in the capital city of Kingston. He pursued his professional career there after earning a doctoral degree in art history at Johns Hopkins University in Baltimore, where he wrote his dissertation on the modern British painter Francis Bacon. 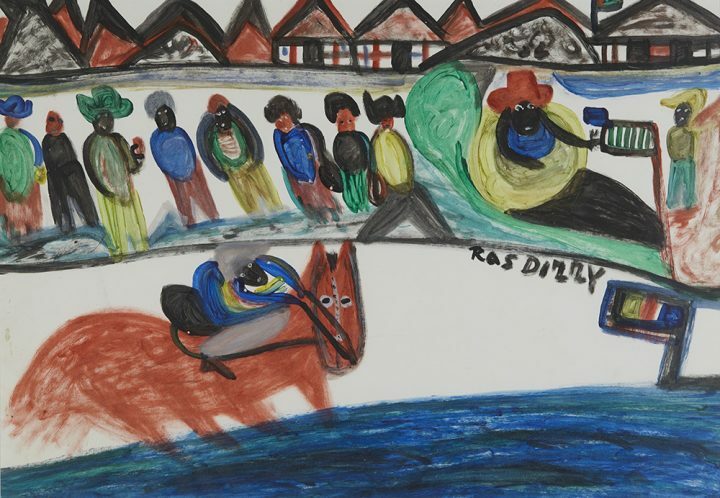 In Kingston in 1975, fresh out of graduate school, Boxer took on the museum director’s role and went on to build what was for little Jamaica a new kind of institution, one that would preserve, protect, and promote the creative expressions of his island country’s native and assimilated visual artists. 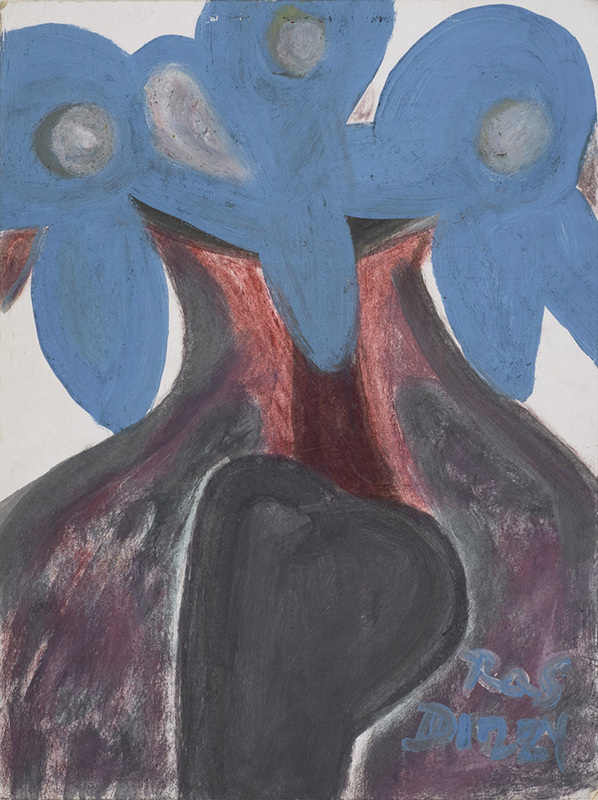 But back to the ostensible subjects of this review, namely the paintings of the Jamaican Intuitive artists Ras Dizzy and Leonard Daley, which are now on display, through November 23, in the exhibition The Bush Have Ears: Ras Dizzy & Leonard Daley at Cavin-Morris Gallery in Manhattan’s Chelsea district. The work of each of these artists fits squarely into the related, sometimes overlapping categories of art brut and outsider art. However, as Cavin-Morris co-founder Randall Morris, a noted researcher and collector in these fields, insightfully points out, Dizzy and Daley’s achievements can — and should — also be appreciated in the broader cultural-historical context of the African diaspora in the Caribbean and the Americas. During its months-long run, he explained, the term “Intuitives,” referring to artists without academic art backgrounds, caught on as a substitute for those other labels. Boxer noted that The Intuitive Eye “took a historical perspective.” It started by presenting works by the Jamaican autodidact John Dunkley (1891-1947), a maker of dreamy-mysterious, almost surreal oil paintings showing animals and human figures in natural settings. Dunkley is considered the dean of Jamaica’s “early” Intuitives; popular appreciation of his work, which he enjoyed during his lifetime, is now seen as something of a starting point in the country’s recognition of self-taught art as a significant component of its national cultural identity. Boxer championed this work over several decades at the NGJ, a position that sometimes annoyed the country’s schooled, “professional” artists, who were endeavoring to adapt modernist modes of art-making for their own thematic and expressive purposes. He supported their work, too. Over time, Boxer’s research helped bring into Jamaica’s art-historical canon the works of such inventive autodidacts as Dizzy, Daley, Albert Artwell, Delores Anglin, Everald “Brother” Brown, Evadne Cruikshank, Allan “Zion” Johnson, Mallica “Kapo” Reynolds, Zaccheus Powell, and many others. He organized two subsequent, large Intuitives exhibitions, which were presented at the NGJ in 1987 and 2006. Leonard Daley (1930-2006) was born and grew up in the parish of St. Catherine in south-central Jamaica. 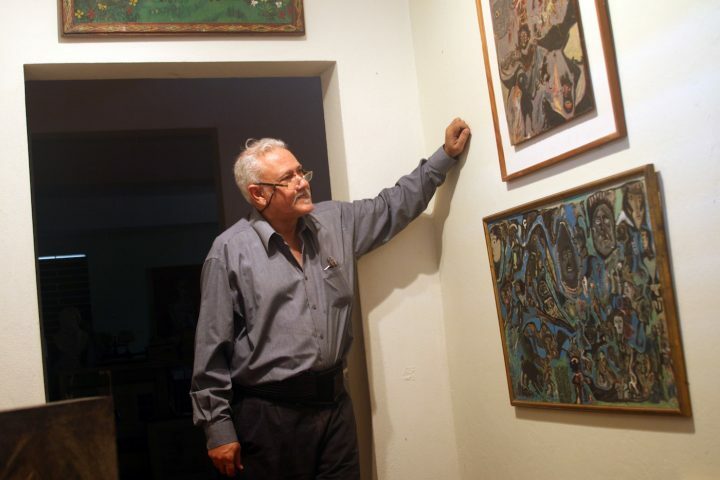 He began making paintings when he was in his thirties, but none of his early works seemed to have survived by the late 1970s, when the local arts community started to become of aware of his art. 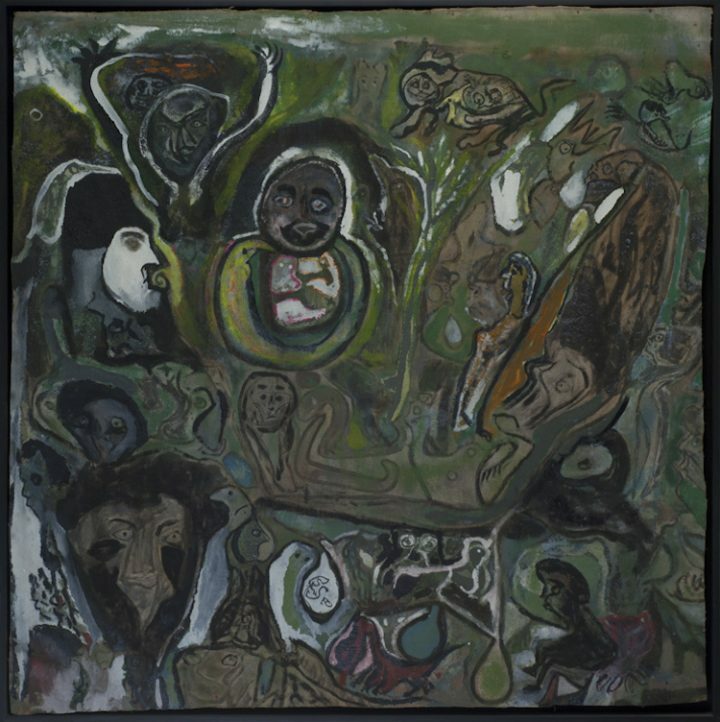 Having learned about Daley’s paintings from Brazil’s ambassador to Jamaica in 1979 during the run of The Intuitive Eye, Boxer included them in that show’s 1987 sequel, Fifteen Intuitives. “I have found the Jamaican Hyppolite!” the Brazilian diplomat enthusiastically informed Boxer, referring to Hector Hyppolite (1894-1948), a painter whose works have become emblematic of the art of his native Haiti. Boxer raced over to Daley’s home in central Kingston and later wrote of his first encounter with the artist’s strange work: “In a darkened garage […] I entered a room that overwhelmed me with its intensity. 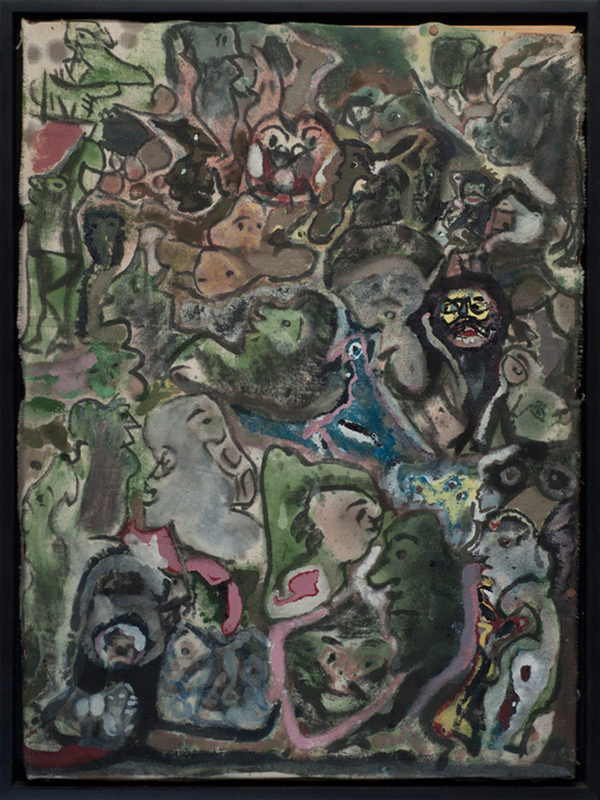 My unease at the unabated angst that screamed from the walls was tempered by the extraordinary inventiveness of […] depictions of […] various animal and human forms, and […] distorted, tortured heads.” Instead of a homegrown Hyppolite, Boxer had stumbled upon a contemporary Jamaican Hieronymus Bosch. 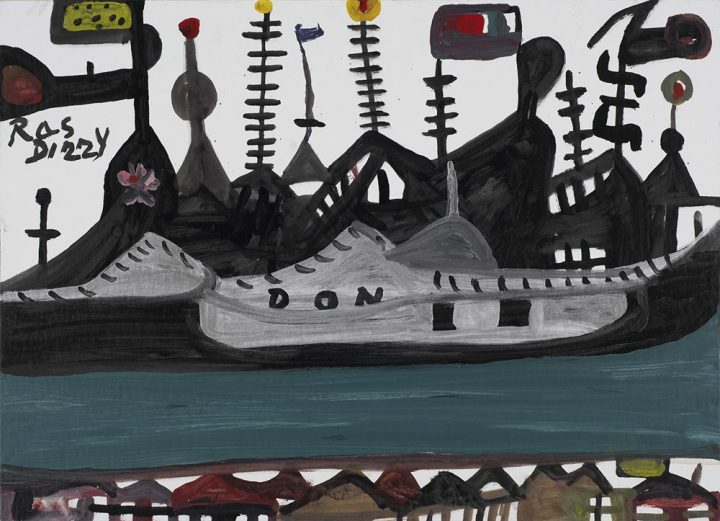 Little is known about Daley’s life story, except that he somehow eked out a living and created his paintings with plain house paint or oil paint on scraps of canvas or found pieces of board. The artist, whom I had an opportunity to meet at his modest, one-room home in the hills near Kingston in late 2005, shortly before he died, produced one of the most original and hard-to-classify bodies of work anywhere. (He had painted the exterior walls of his simple dwelling, which was filled with his artworks.) Partly abstract, partly surreal and partly realist (in its depiction of birds, snakes or plants), Daley’s art exudes a deeply psychic-spiritual air. His paintings offer a rich stew of allusions to the power of natural forces, humankind’s relationship to the animal world, primeval spirits, and the irrepressible fecundity of the earth. Daley’s semi-abstract images evoke a sense of universal consciousness — a kind of Jungian, primordial, collective memory. The late Annabella Ogden Proudlock, who died last year, was an arts activist, collector and art dealer who co-founded Harmony Hall, an art gallery in Ocho Ríos, on Jamaica’s north coast; she once told me that, over the years, her gallery showed and actually somehow managed to sell Daley’s unusual works to collectors who appreciated their strangeness and their affinities with classic, European art brut. At the same time, in broader art-historical terms, Daley’s churning compositions may seem to share affinities with certain psychologically intense, Surrealism-related, American modernist works from the period just before the eruption of full-blown Abstract Expressionism in the 1940s. Morris’s developing interest in the Jamaican Intuitives led to his organizing of Redemption Songs: The Self-Taught Artists of Jamaica, an exhibition that opened in 1997 at Winston-Salem State University, in North Carolina. Since then, Cavin-Morris has presented numerous exhibitions examining different aspects of what Morris has dubbed the common “home ground” of self-taught artists of African ancestry in the Americas. This concept refers to their shared, tradition-nourished roots or creative foundation, which, as Morris describes it, is at once cultural, social, spiritual and psychic. Ras Dizzy (c. 1932-2008) was an itinerant poet-artist, whose real name was Birth Livingstone. Like many details of his biography, which remains sketchy at best, his name was a fabrication. “Ras” is a Rastafarian honorific; Livingstone became known as “Dizzy” in honor of the tall tales he told about his victories as a horse-racing jockey, bouts in the ring with boxer Cassius Clay (who later changed his name to Muhammed Ali), travels to Hong Kong, and long rides with the cowboy-movie hero John Wayne across Hollywood’s Wild West. Dizzy became known in the 1970s among students at the University of the West Indies in Kingston, where he availed himself of a mimeograph machine to make copies of his verses to hand out to passersby. He also began to sell his ballpoint-pen drawings on paper, whose early imagery included the doctor bird, a long-tailed humming bird that is Jamaica’s national symbol. Dizzy had no home of his own. Instead, he routinely made his way around Jamaica, dropping in on friends and acquaintances and exchanging his paintings in poster paint (industrially produced tempera) on illustration or mat board for food and lodging. On a few occasions, during my visits to Ogden’s home in Ocho Ríos to examine her art collection or interview her about her involvement with the Intuitives, Dizzy would unexpectedly turn up, and I would sit and chat with him while he nibbled eggs and toast, sipped coffee, and smoked cigarettes — or stronger, pungent spliffs. He would show me the drawings he had with him or that he was working on and ramble on about his imaginary adventures around the world, which were all very real to him. “What are these colorful stripes?” I asked him one time as I examined an abstract drawing whose composition did not resemble his more familiar images. “That’s a picture of my dream,” he explained. Unwittingly, perhaps, Dizzy was a kind of stylist; with bold outlines and brightly colored, flowing forms, he represented his favorite subjects — fortune tellers, horse races, palm trees, ships and birds — using broad brushstrokes in abstract or semi-abstract compositions. 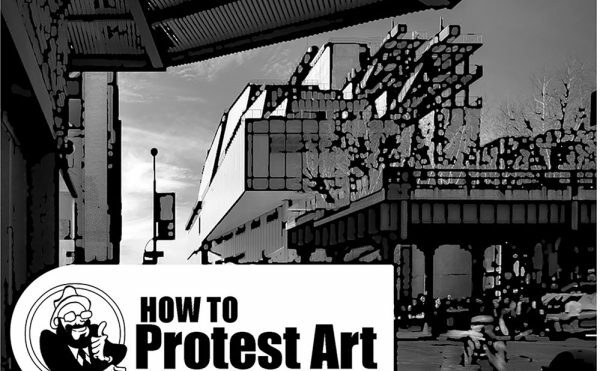 This New York exhibition comes at a time when the work of talented, visionary autodidacts, especially new discoveries, has become more sought-after than ever before. 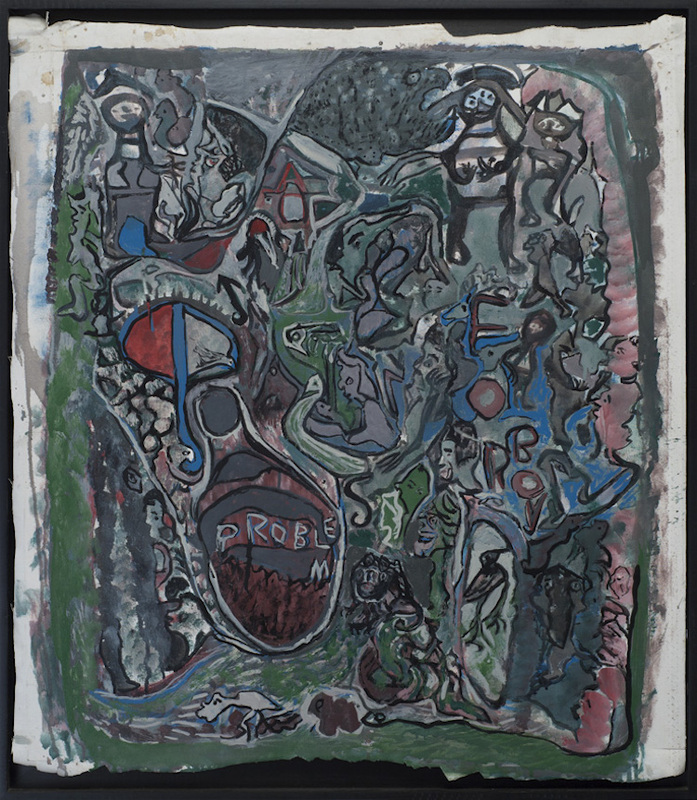 It serves as a reminder that some of the strongest, most original bodies of work by such artists can be found far away from outsider art’s historically familiar turf in Western Europe and North America. Much of the best work by the legendary Jamaican Intuitives has long been held by private collectors; rarely has such a trove of works by Daley and Dizzy been displayed in such a full and resonant presentation as the one now on view at Cavin-Morris. The gallery has done an especially good job of framing Daley’s unstretched paintings on canvas, having devised an effective way to mount them while allowing them to “float” inside simple, black-painted shadowbox frames, which accentuate the character of each artwork as a picture and an artifact at the same time. I spoke with David Boxer by telephone several days ago, at which time I learned that he had been ailing. “I’m delighted that Leonard Daley and Ras Dizzy’s works are being shown in New York,” he said, sounding alert but also fatigued. He added, “They were great artists, whose work deserves to become known far beyond Jamaica.” I expressed my agreement and pointed out that, as time passes, any success these works might enjoy in the wider international art market will owe a lot to the serious attention he paid to them earlier in his career. The Bush Have Ears: Ras Dizzy & Leonard Daley continues at Cavin-Morris Gallery (210 11th Avenue, Chelsea, Manhattan) through November 23.